As the 7DAYS EuroCup regular season reached its mid-point this week, a record-tying performance by Adas Juskevicius of Lietkabelis Panevezys earned him the MVP honor for Round 5. Juskevicius exploded for a career-high 31 points to lead his team past visiting Buducnost VOLI Podgorica, 86-79. 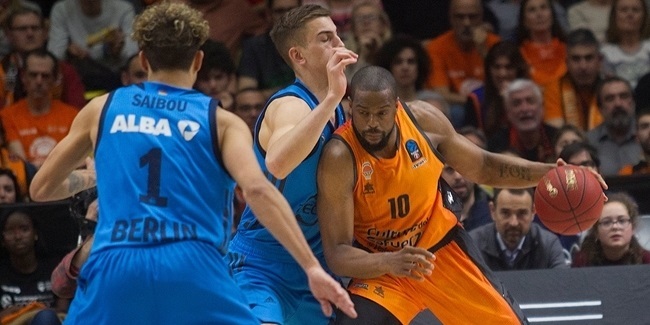 The EuroCup's highest point total of the season was based on his 9 three-point shots made, including 7 consecutively in the first quarter! Those 9 triples tied the EuroCup single-game record. 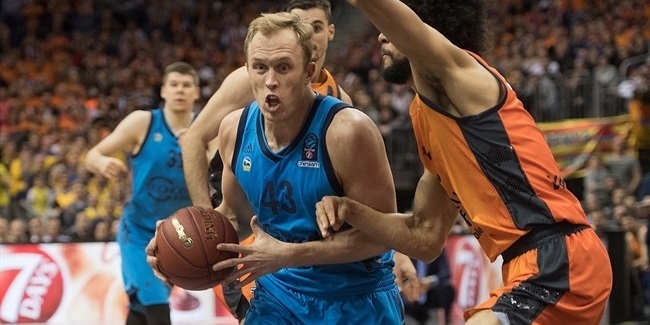 Juskevicius also had 4 rebounds and 5 assists for a performance index rating of 38, another personal high that tops all EuroCup players this season. His total points, three-pointers and PIR also also marked club records for Lietkabelis in the competition. Second in line this week was UNICS Kazan's Quino Colom, whose PIR of 36 included a career-high 26 points and 10 assists. Colom paced UNICS to a 101-93 win over Fiat Turin. Next came Remy Lesca of Levallois Metropolitans, whose PIR of 32 featured 21 points, 6 assists and 3 steals, all career highs, in his team's first victory, against visiting Cedevita Zagreb. Stephane Lasme of UNICS followed with 24 points, 11 rebounds and 10 fouls drawn for a PIR of 31 against Fiat. And Dmitry Kulagin of Lokomotiv Kuban Krasnodar posted a PIR of 29 based on 17 points and 6 assists as his team beat Partizan NIS Belgrade away. Unsuprisingly, the best scorer of the week was Juskevicius, whose 31 points are the best of any player this season so far. Amedeo Della Valle of Grissin Bon Reggio Emilia leads the season-long charts at 21.0 points per game. 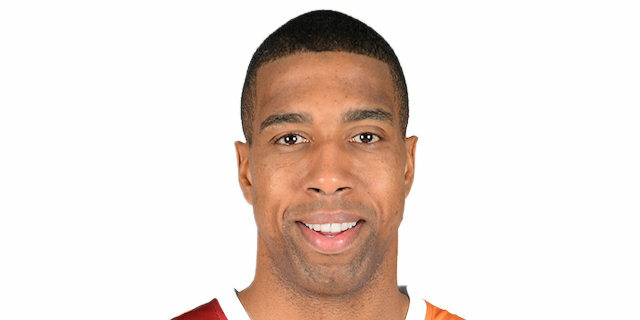 Under the glass, Richard Hendrix of Galatasaray Odeabank Istanbul ruled with 12 boards. 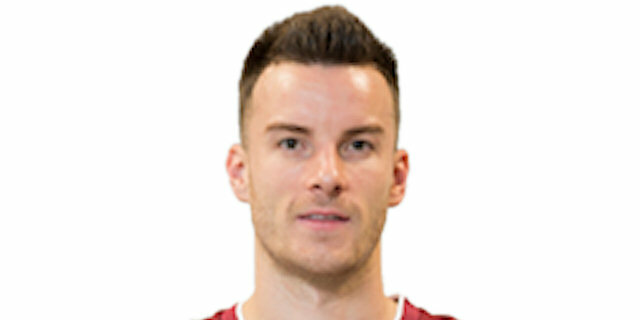 Drew Gordon of Zenit St Petersburg is the overall leader with 10.0 boards per game. Baris Ermis of Tofas Bursa had a career-high 12 assists to lead all passers this week. Chris Kramer of Lietuvos Rytas Vilnius tops the charts with his 8.3 per game. Reggio Emilia's Jaylen Reynolds was aggressive on defense this week with his 6 steals. Toto Forray of Dolomiti Energia Trento still tops the season charts with 2.4 per game. 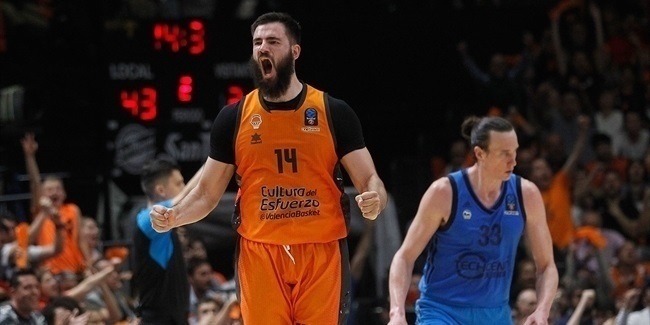 Finally, three players had 3 blocks each this round: Kulagin, Evgeny Valiev of Zenit, Ojars Silins of Trento and Mickell Gladness of RETAbet Bilbao Basket. Lasme leads all players in blocks this season with 1.8 per game.